WordOfGraceChurch: Through the eyes of the wise men. Through the eyes of the wise men. This message was preached by Colin D' Cruz at Word of Grace Chruch, Pune. You can also listen to the AUDIO version by clicking here. Perspective is important. A lot depends on whose eyes you things through. Some years ago when Andrew was an infant I met a colleague from work who had a ten year old daughter and I remarked on how big she was. The colleague remarked to the contrary saying her friend’s children were much older and that she felt that her daughter was very small. When we go through the gospel and look at the birth of Jesus we can see it from different perspectives. Today we will look at it through the eyes of the Wise men. 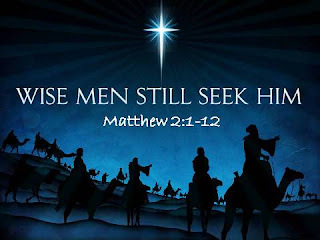 Let’s look at the birth of Jesus through the eyes of the Magi or the wise men. The story of the wise men is shrouded in the story. How many wise men were there? We don’t really know. We know they brought three kinds of gifts but they could have been more than three men. Where did they come from? What does scripture say? - “east of Jerusalem” Tradition says they came from Iraq. But we don’t know. How long did they travel? Again we don’t know but what we do know is that it was a journey of faith. We can learn three things from the wise men this morning. 1. It was a journey of FAITH. V2. Where is the one whose has been born the king of the Jews? What we know is that they saw a star in the east and followed it. In those days they did not have GPS. We saw the eclipse last night. In those days they navigated themselves looking at the star. They know if they followed the star they would find the king the Jews. In those days travel was not safe – they were bandits, no posh hotels. We’ve heard the story of the Good Samaritan – so we know about the dangers travellers faced in those days. Imagine the neighbours asking the wise men were they were going and they say they don’t know. When asked how long the journey would take, they didn’t have an answer. Don’t sound pretty wise to me!!! But that’s how Christians ought to live – like the wise men. We don’t walk by sight but by FAITH! Abraham walked by faith. He left the most advanced civilisation of that time to follow God who called him to go to another land. Others like Noah- God told him to build a boat. What boat? What is rain? Imagine if you start building a boat tomorrow. Your neighbours are going to think something is the matter with you. But Noah accepted that with faith. Peter – Jesus told him that he would not make him a good fisherman but a fisher of men. Imagine when Peter told his wife. She must have said “What? Are you going to give up your job and are you going to catch men like fish and sell them?” A journey of faith for a Christian always involves steps of faith. The Bible highly values faith. Without faith it is impossible to please God. So whatever we do we should do it in faith and God is pleased. When we took the offering – we are taking a step of faith. When we give we are saying that the 90% I keep will be more than enough. When I give out the Christmas invitation I am mixing it with faith and hoping the Lord will bless my efforts. Sometimes it is more difficult like when Peter stepped on the water or the feeding of the 5000. This is what God is asking us to do. What steps of faith is the Lord asking you to do? As you take steps of faith God will reward you. We personally gave money to the gift day – and before the month is out we got 10 times that amount back. Take steps f faith. If you have not had people in your house – start to practice hospitality. When we are weak his grace is sufficient. William Carey – was a cobbler. He was a humble man. He saw the need for the gospel to come to India. And through him India has been blessed tremendously. He is called the father of Indian Mission. He translated the bible into many languages. He wrote grammar books for many Indian languages. He exercised a little faith and look what he accomplished. What does God want to do through you? 2. Their journey was one of WORSHIP .The Wise men wanted to worship Jesus. They recognised the value of finding Jesus. Part of their worship involved giving – they came with gifts of gold, incense and myrrh. They worship involved cost. They gave him gold – fit for a king. Incense – used for worship acknowledging, that he deserved worship. Myrrh – symbolized that one day Jesus would be given as a sacrificial lamb and the myrrh would be used to embalm him. Their worship involved sacrifice – they travelled a long, long way on a Camel. Have you sat on a Camel? They did not travel in a comfort of an a/c coach, plane etc. I was talking with a pastor who told me in the north east people walk 2 hours to get to church and then another 2 hours back. God is looking for sacrifice in our worship. There has got to be a cost. Let s not give something that does not involve sacrifices . Let’s aim to be to church on time – that’s the least we can do. Rom12 Therefore brother in view of God’s mercy.... since God has done all this for you can you not offer your body as a living sacrifice. Are you willing to use your good health and your body to serve God? Ask the yourself and the Lord – what can I sacrifice? This morning I want to ask you – what will you offer to Jesus? There's got to pain. Sacrifice is not painless. Are you willing to step out of your comfort zone? One day you will get a reward. Jesus will say well done. 3. The wise men s journey was one of CHANGE: v12. When we encounter the Lord Jesus something happens. Something changes in us. If you have not changed then the there is something wrong. John the Baptist spoke of repentance. The first change is that of repentance. Jesus came to save us from the power of sin and death. Jesus doesn’t just want to save us but cleanse and change us as well. Often we want only fire insurance – to be saved from hell. But we should want to change as well. Jacob from a deceiver became the prince of God. Take Isaiah when he encountered God he realized he was a man of unclean lips. He became aware for his own sinfulness. When we encounter God change must take place. Jesus is the light of the world. When light comes in darkness must go. As Christians God is not calling us to live a totally sinless life (he knows it will not happen this side of eternity) but to a progressively sinless life. Each day we should be aware of how we sin. Are you aware of it? So the wise men embraced change – Herod was not be trusted and they changed their route. So we learn three things from the wise men. It’s a journey of faith, a journey of worship and a journey that involves change. As we do this we will have a truly have a Merry Christmas. What s so amazing about Christmas?